Most of the time powdered milk is more economical than fresh milk, but not always. To determine whether fresh or powdered milk is more economical in your area you need to know the price of a gallon of fresh skim milk and the price of a 4-pound box of powdered milk. Divide the cost of the 4-pound box of instant nonfat dry milk by 5 (which is how many gallons of liquid milk it makes). Then compare the prices. Sometimes powdered milk is half as much as fresh milk. Sometimes fresh milk is about the same price, or even cheaper than powdered milk. The price of powdered milk is usually pretty stable, but the price of fresh milk fluctuates widely. Choose the type of milk that is most affordable to you. There are two basic types of powdered milk available at the market today. The most common, and usually the most economical is Instant Nonfat Dry Milk. Large, 4-pound boxes are usually the best buy, meaning they have the lowest unit price. This is the price per ounce or per pound. Smaller boxes are available, but they usually cost more per ounce. 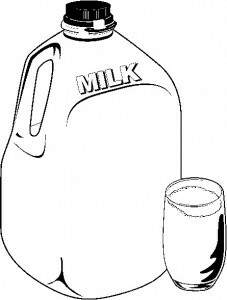 Nonfat dry milk can be reconstituted (mixed with water) to make the equivalent of fresh skim milk. It’s high in protein, calcium and Vitamin D. It’s nearly cholesterol free and fat-free. Plus it’s low-calorie, with only 80-calories per 1/3-cup dry, or 1-cup of reconstituted milk. Whole powdered milk is also available. The brand name that seems to be the most common is Nestle’s Nido Fortificada. It’s available in 3-1/2 pound canisters and 12-ounce canisters. The 3-1/2 pound package is usually the best buy. It usually costs more per gallon than nonfat dry milk, but less per gallon than fresh whole milk. A 3-1/2 pound package makes about 3-1/3 gallons of milk. Divide the cost per package by 3.33 to determine the cost per gallon of reconstituted whole milk. Powdered whole milk is high in protein, calcium and Vitamin D. It has all of the fat that you would find in fresh whole milk. Nido Fortificada is also fortified with a few vitamins and minerals such as iron, zinc, Vitamin C and Vitamin A. Not all whole milk powder is fortified, but Nido Fortificada is. Like fresh whole milk, powdered whole milk has about 150-calories per cup of reconstituted milk or per 1/4-cup of dry milk. When reconstituting powdered whole milk it’s best to use room temperature or even warm water. This allows the milk to dissolve most readily. Do not use boiling water, which will make it clump up something fierce. Instant nonfat dry milk dissolves readily in a wide range of temperatures from very warm to very cold. It will even dissolve in boiling water if you stir it with a wisk and a snootful of determination. Powdered milk is easy to use in cooking, where the flavor is less noticeable. Over 30-years of cooking, I’ve used reconstituted milk in every type of recipe, from sauces and soups to cake, muffins and even custard. It is impossible to tell that you’re using reconstituted dry milk. Recipe mechanics work the same and the end products are just as tasty as if you used fresh milk. When powdered milk is cheaper than fresh milk, using it in cooking is an easy and painless way to reduce your grocery bill. If you have a small family simply mix up a quart of reconstituted milk and keep it in the fridge. 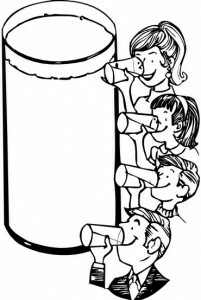 If you have a larger family, mix up 2-quarts or even a gallon at a time. When you’re cooking, simply grab your reconstituted milk and use it instead of fresh milk. Clean, empty mayonnaise jars hold a quart and have wide enough mouths that they’re easy to keep clean. They are convenient for mixing up a single quart at a time. Drinking powdered milk is a whole ‘nother kettle of fish. 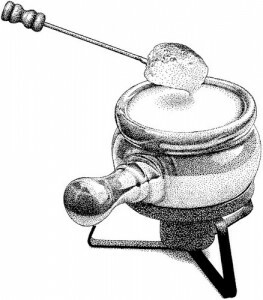 Powdered milk has a poor reputation in a lot of circles. There is a stigma attached to powdered milk, that only destitute people drink it. That it tastes bad, that it’s not as nutritious as fresh milk. It seems like only people of low status and poor reputation drink powdered milk. All of this is a bunch of hogwash. Not a bit of it is true. Still, the reputation persists. The first hurdle you have to surmount is giving yourself permission to put all of those nasty rumors to rest and admit that drinking reconstituted milk is a perfectly good and legitimate thing to do. Drinking powdered milk doesn’t mean that you’re poor, stupid, uneducated or of low status. It simply means that you’re smart enough to know a good thing when you see it, and that you love your family enough to be fiscally responsible. The second obstacle is the taste. Some people persist in believing that reconstituted milk doesn’t taste good. While I freely admit that it doesn’t taste exactly the same as fresh milk, I firmly stand by the statement that is does, in fact, taste good. You have to make sure it’s well chilled before you taste it. Warm, freshly mixed powdered milk, doesn’t taste bad exactly, but it doesn’t taste as good as milk that has spent the night in the refrigerator. Cold reconstituted milk tastes best. If you’re already accustomed to skim milk, then cold reconstituted milk will have a similar flavor. If you are accustomed to fresh whole milk, then reconstituted nonfat milk will taste weird. Part of the reason is because you are used to whole milk, not nonfat milk. In this case try reconstituted whole milk, so that you’re comparing apples with apples, instead of apples with oranges. Reconstituted milk tastes best if your box isn’t too old, and if you mix your milk according to package directions. Old powdered milk does not taste as good as a fresh box. If your box of milk has been opened for a year or longer, the milk you make from it probably will not taste as good as milk made from a fresh box. 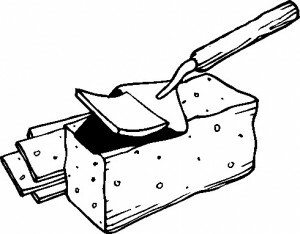 The old box can still be used for cooking, but you owe it to yourself to buy a new box of powdered milk for drinking so the milk you make from it will not taste stale or old. If you don’t follow the reconstituting directions on your package, using more or less milk powder than required, it can give the resulting milk a weird flavor. 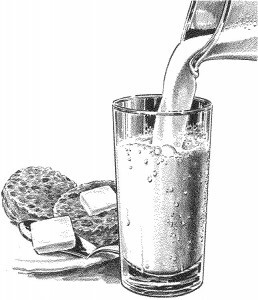 Mixed correctly and chilled overnight, reconstituted milk has a pleasant, mild, almost sweet flavor. Remember that most likes and dislikes are a matter of what we’re accustomed to. My children grew up drinking nonfat dry milk and when they had fresh whole milk at friends’ houses, they thought it tasted terrible. 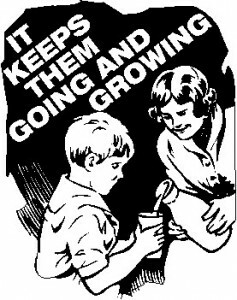 I grew up using nonfat powdered milk and drank it almost exclusively for 30 years. I could tolerate fresh skim milk, but even 2% milk tasted weird to me. If reconstituted milk tastes weird to you, then give yourself a little time to become accustomed to it. Work up to it gradually. Use the money you save from using it to motivate you into giving it a sincere and honest try. For convenience, here is a chart for mixing your own reconstituted nonfat milk. 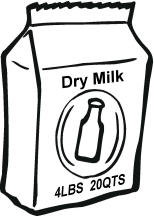 Dry whole milk is a little different from nonfat dry milk. Here is a handy chart for mixing your own reconstituted whole milk. The tables above will help you work out the amount of powdered milk needed to prepare specific measurements of liquid milk. Here are some tips to help the milk turn out as fresh tasting as possible. Fill your pitcher or container with about half of the required quantity of water. Measure in the appropriate amount of dry milk. Stir briskly to dissolve. Fill the pitcher with the balance of water. Stir again and chill. For instant nonfat dry milk, use cool water when possible. Nonfat dry milk powder tends to dissolve more readily in cool water. For dried whole milk, use warm water if possible. Whole milk powder dissolves more readily in warm water. Stir the milk a lot to dissolve the milk powder. Then let it sit for a few minutes and stir it again. The protein in dry milk blends more easily if it gets a chance to stand for a little while after mixing. Powdered milk may be used immediately after mixing if desired. For the best flavor though, chill the milk for at least 4-hours or overnight. Serve it with a meal or another food, so it’s not the focus of the family’s attention. Store the milk in a refrigerator if you have one. If you don’t, then wrap the pitcher or jar in a wet towel. As the water evaporates, the milk will cool. If you have a root cellar or basement, you may want to keep the milk there, or even outside in the fall and winter. If you store the milk outside be sure it’s protected from critters who may be thirsty. A box with a large rock on top is sufficient to keep out most animals. If you do not have refrigeration, then only prepare enough milk to last the day. I prepare it the night before, so it has a chance to blend and chill overnight. About 2-quarts will be enough to last a family of 4 for most of the day. If you continually find you have some left over, then prepare less the next day. If you find yourself running out, then prepare more. Some people add a drop or two of vanilla to their milk to improve the flavor. Other people add a spoonful or two of sweetener for the same purpose. I don’t use either of these ideas, because we are accustomed to the flavor and prefer it plain. 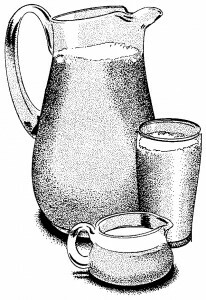 Pitchers and wide-mouthed jars are the most convenient containers for mixing and storing reconstituted milk. I used to try to use apple juice jars, but they are difficult to keep clean and awkward to pour the dry milk into. If you must use a narrow mouthed jar, then you need a funnel. A chop stick or spoon handle is handy for poking down though the funnel tip when things get clogged up. Wide mouthed canning jars, or even clean, empty mayonnaise jars are convenient for mixing and storing reconstituted milk. 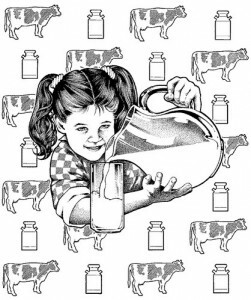 Most of us grew up being taught how important milk is for our daily diet. 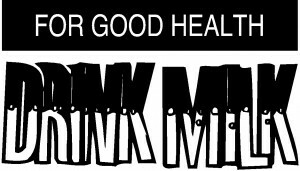 Current recommendations are that adults drink at least 2-cups of milk a day. 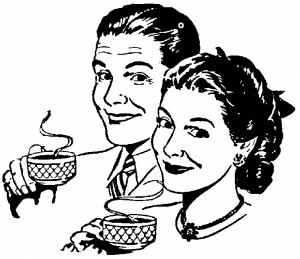 Women are encouraged to drink 3-cups if they want to prevent osteoporosis and pregnant or lactating women are advised to drink 4-cups of milk a day. If you prefer to consume cheese for part of your milk quotient, then 1-1/2 ounces of cheddar or mozzarella is the same as a cup of milk. Two-ounces of processed cheese such as store-brand Velveeta is equal to 1-cup of milk. So we know we should be drinking milk, but when we’re broke, what are the best deals in the dairy case? I wish there were an easy answer, but the truth is, the best deals tend to change from year to year, so I can only provide a few specifics. It used to be that powdered milk was always the best buy among all dairy foods. At the time of this writing (fall, 2015) that is not true. It will be true again, in a year or two, but currently the best buy in the dairy case is fresh, nonfat skim milk. Fresh whole milk costs more. Nonfat or skim milk costs the least. In my area, which is often touted for its low cost of living, fresh skim milk is as low as $2.50 a gallon. The cheapest powdered milk I can buy works out to be $2.77 a gallon ($15.28 for 22-quarts). While I still believe powdered milk to be a good deal, it is not the best deal. A few years ago the price of fresh milk was almost twice as expensive as the cheapest powdered milk. In a few years that is likely to be the case again. With this in mind I share a lot more detail about powdered milk in another article, so that it will be readily available when that time comes. Even now, if you live a feast and famine lifestyle, when you sometimes have more cash than others, powdered milk is good to stock up on when you have the cash. It keeps well in the pantry, even after opening, so that when you are dead broke again, it will be there–ready and available. The cheapest powdered milk is usually instant nonfat dry milk, in 4-pound (64-ounce) or 20-quart (5-gallon) boxes. 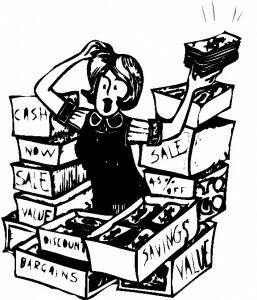 Look for store brands and value brands for the best price. They all taste pretty similar, so don’t be afraid to try a lower priced brand. 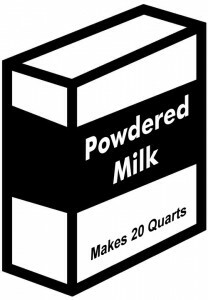 Most brands use 1/3-cup powdered milk to make 1 cup of liquid milk. You can also find powdered whole milk pretty easily these days. The brand I am most familiar with is Nestle’s Nido Fortificada brand. I usually find it in the Latino section of the supermarket. It’s available in 3-1/2 pound canisters (56-ounces). Each canister makes 3-1/3 gallons of milk. It costs about the same per package as nonfat dry milk, and makes fewer gallons. This means it costs more than nonfat dry milk. It does taste very good however, and if you have a chance to buy some when you do have the cash, it can be quite convenient when times are hard again. After opening, powdered whole milk does not keep as long on the pantry shelf as nonfat dry milk. Try to use it up within 3-months of opening it. 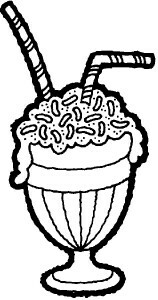 It will still be nutritious if you keep it longer, but it won’t taste quite as good when reconstituted. Nido powdered milk uses 1/4-cup of powdered milk to make 1-cup of liquid milk. Canned Evaporated Milk is useful, and often available from food pantries. I do not consider it a necessity, although it is a convenience. When I buy it I prefer whole evaporated milk, not the skim kind. I can make my own evaporated skim milk by combining 1-cup of water with 2/3-cup nonfat dry milk powder. I can make my own evaporated whole milk by combining 1-cup of water with 1/2-cup of whole milk powder. Evaporated whole milk costs only slightly more than homemade evaporated whole milk. If you have a little extra cash, canned evaporated milk is a reasonable investment. If you are pinching every penny until it squeaks, there is no real need for it. 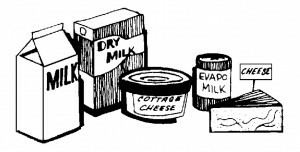 After milk, the best buy among dairy foods is processed cheese like Velveeta, only in a store-brand. Name brand processed cheese is too expensive for our budget, but a store-brand is quite affordable. Velveeta and other processed cheeses are not usually in the dairy case. In my stores it’s near the pizza and spaghetti sauce. Two-pound blocks are usually the lowest price per pound. It keeps well in the cupboard until you open it. At that time it should be refrigerated. Velveeta can be sliced and used for sandwiches. It can be cut up into small bits with a knife, or mashed in a bowl with a fork, and used for casseroles or sauces. If you really want to shred it then freeze it first. While it’s still frozen it can be shredded quite nicely. Knives don’t work especially well for slicing Velveeta, although they do the job if you dont’ have anything else available. However, if you have a wire cheese slicer, the kind that come in holiday gift boxes of cheese that well-meaning but distant relatives sometimes give you for Christmas, they work the best. Processed cheese is higher in protein than cheddar cheese. It’s designed to melt more easily too. If you use cheese to make cheese sauce or add it to broccoli cheese soup, then processed cheese will work better than cheddar. It melts more smoothly and doesn’t clump up or become grainy the way natural cheese can. Processed cheese also makes divine homemade macaroni and cheese and fried cheese sandwiches. Since processed cheese is the most affordable type of cheese you can buy, it’s the one you should use the most often. If you are preparing a recipe and it calls for shredded cheese think about whether or not processed cheese will work just as well. You may prefer mozzarella for a pizza, but in a pinch, Velveeta will work almost as well. You have to take the time to cut it into small pieces, but it will get melty and cheesy the same way mozzarella will. At my stores I can find both orange and white processed cheese in the lowest price value-brand. To some people the color of their cheese isn’t a big deal, but to others it’s of vital importance. Velveeta keeps well in the refrigerator, so if you want to have both colors available for your cooking whims, it’s not likely to go bad before you use it up. If you live a feast and famine lifestyle, processed cheese is a good choice to stock up when times are good, so you have it later, when times are hard again. Among hard cheeses, shredded cheddar and mozzarella, in large bags are usually the best buys. Shredded cheese is easy to freeze, so if you buy a large bag and are concerned you won’t use it up before it molds, simply transfer it to several plastic zipper bags and stash it in the freezer. If your family is small this is a good way to get the lowest price on cheese without any accompanying waste. Also remember that our hands, no matter how clean they are, carry bacteria. If we place our hand inside of the bag of cheese we introduce bacteria into the bag and cause it to mold faster. 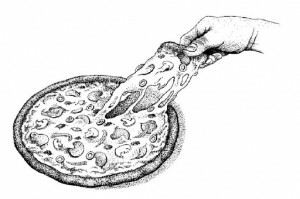 It’s better to shake the cheese out of the bag, without actually placing our hands in with the cheese. This will allow it to stay fresher, longer. Parmesan cheese, the grated kind in a green shaker jar, is another affordable option. One-pound jars are usually less per pound than the more common 8-ounce jar. Parmesan keeps well in the refrigerator so if you can afford the larger jar, it’s worth buying. Since it keeps well on the pantry shelf, parmesan is a good choice for stocking up when you have the cash. 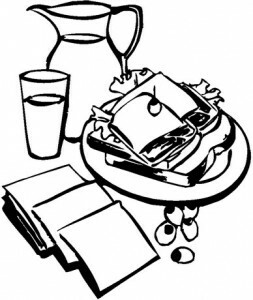 Soft cheese, such as cream cheese and cottage cheese are a personal choice. I buy cream cheese now and then, but it’s not something I use so very often. Cottage cheese is a personal favorite of mine, and it’s high enough in protein that I feel justified in its use. While useful, these are not necessities. If you’re watching every penny, these are items I would leave out of my budget. Lastly I want to talk about yogurt. The most affordable kind is plain, homemade yogurt. 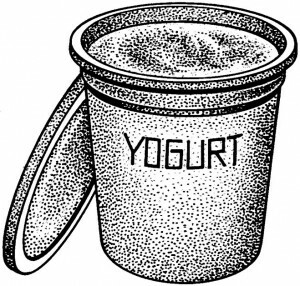 At current prices, a quart of store-bought yogurt costs as much as a gallon of milk. Yogurt is one of those things you can make at home without too much work. Not everyone is willing to make it at home. In that case, your best buy is the lowest priced value-brand of plain, nonfat, unflavored yogurt–usually in quart-sized tubs. It will cost 3 to 4-times as much as making it yourself, but it’s extremely useful to have on hand. 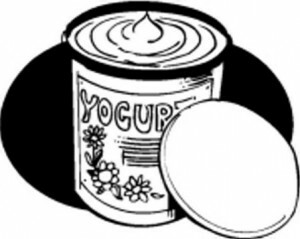 I routinely use yogurt as a replacement for sour cream and buttermilk in cooking. It’s a good snack, great breakfast, goes into smoothies, desserts and can even be turned into a facsimile of cream cheese called yogurt cheese. If you’re into urban homesteading, then making your own yogurt is pretty much par for the course. If you are truly rock bottom broke and want to give yourself the most varied diet you can within your limited budget, then homemade yogurt is worth learning. When I post my recipe and method for homemade yogurt, I’ll link it here. Even if you don’t want to make your own homemade yogurt, the store-bought stuff is nutritious and worth buying when you can afford it. Do not buy the sweetened or flavored versions. You get more nutrition and more versatility from plain, nonfat yogurt. At home you can stir a spoonful of jam or a drizzle of honey into your own yogurt and give it all the flavors you can imagine. If you need portable yogurt then spoon some into a small jar with a good lid and carry it with you. Small plastic resealable containers, about 4 to 8-ounce each, are also good choices. You’ll be preserving the environment by reusing your own container and you’ll save a lot of cash over buying single serving containers. Greek Yogurt is a very thick version of regular yogurt. It has about twice the protein as ordinary yogurt but it also costs twice as much. That means that a quart of Greek Yogurt costs about as much as 2-gallons of milk. To my mind, this is far too expensive for our rock-bottom budget. If you don’t have a car, or have mobility issues, you can save a lot of cash by shopping through mail order. Use a debit card, not a credit card, to pay for your purchases. For the lowest prices and the most useful products, these are the specifics. Shop at Walmart.com, which provides free shipping if you spend more than $35. Choose from the following items in quantities appropriate for your needs. This is my rock-bottom broke version of coffee for the morning commute. The first recipe is for a single serving. If you scroll down a bit, you’ll find a recipe for a big batch. You may use white sugar or brown sugar in the recipe. White sugar is much cheaper. Brown sugar is traditional for European or New Orlean’s style coffee. If you are paying $2 to $5 a day for a fancy cup of coffee because you’re always in the rush in the morning and don’t have time to brew your own, then consider preparing this instead. I know it’s a terrible blasphemy to suggest instant coffee instead of fresh brewed, but sometimes economy and time constraints must take precedence over aesthetics. Try this for a week and see if you can live with it. First find and wash a reusable travel mug with a lid. You can find them at Dollar Stores for $2 and they pay for themselves the first time you use them. Besides that, a reusable mug is a green solution because you’re not wasting a disposable cup every day. After washing your cup prepare a big batch of café au lait using the cheapest instant coffee you can find. You may feel anxious, but stiffen your upper lip and carry on. The next morning that you’re in a rush heat 2-cups of water to a boil in the microwave or on the stove. While it’s cooking you can tie your shoes or brush your teeth. Measure 1/3-cup of café au lait mix into your travel mug. Stir in the boiling water. Place the lid on the cup and rush out the door. You have just saved yourself not only the cash outlay of a cup of coffee, buy you’ve also saved the time you had to wait in line to purchase that cup of coffee. Now give the coffee a slurp. It’s not as bad as you thought it would be, is it? A quick note for the coffee snobs, if you are really disgusted with the quality and flavor of the cheapest instant coffee then you may use Taster’s Choice brand French Roast in this recipe. I defy you or even the most educated palate to differentiate between this and fresh brewed coffee, especially with the addition of sugar, creamer and milk. Taster’s Choice costs about twice as much as the cheapest instant coffee you can buy, but it still costs less than buying a cup to go from your local coffee shop. 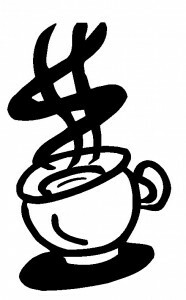 If you drink homemade Café Au Lait 5 days a week, instead of buying a $2 cup of coffee, you’ll save about $450 a year. If you drink it instead of buying a $5 cup of coffee, you’ll save $1235 a year. You’ll also save the 10 to 20 minutes you spend waiting in line. Most of us could use that extra time during the morning commute. 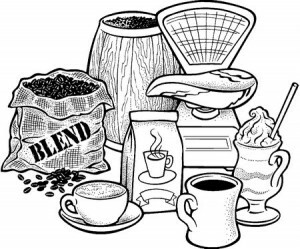 Measure all of the ingredients into a coffee cup. Add hot water and stir to dissolve. Savor the flavor of savings and convenience. NOTE: 1-1/2 teaspoons is the same as half a tablespoon or 1 very heaping teaspoon. Every time you drink this instead of buying coffee from the local coffee shop, you save $2 to $4 bucks. If you are out of either powdered creamer or dry milk, then double up on the one you do have. This would be 1/4-cup of dry milk powder or 1-tablespoon of powdered creamer. Measure all of the ingredients into a zipper bag or a clean jar. Mix thoroughly. Store on the pantry shelf and use as desired. 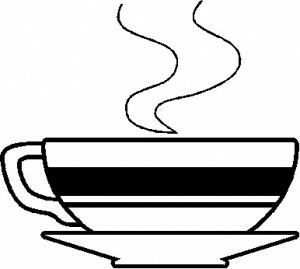 Measure 2 or 3 heaping tablespoons into a coffee cup. Add hot water to fill and stir to dissolve. Use 1/3-cup for a large (16-ounce) travel mug. Have you ever spent $5 on a Frappuccino? I haven’t. But my taste testers tell me that this tastes just like the ones they get from upscale coffee shops. If you agree, and even if you don’t, be sure to let other readers know in the comment section. This is similar to my Magic Milk Shake recipe. Place all of the ingredients into the blender, including the oil and the non-stick spray. Use less water for thicker milk shakes and more water for shakes that are easy on your blender motor. The blender should be about 3/4-full. Place the lid on the blender. Process for a full 2 minutes. Pour into cups and serve. Makes four 12-ounce servings OR three 16-ounce servings. I invented this recipe over a decade ago when the kids were begging for milkshakes, and there was no ice cream in the house. I kept thinking about smoothies and protein drinks and slim-fast powdered shake mix and how people claimed that they could make them taste like milk shakes by adding ice cubes to the mix. I fiddled around with blender and eventually came up with recipe. I have made it with powdered soymilk and it works just as well as powdered dairy milk. Use enough powdered soymilk to make the equivalent of 1-quart of liquid milk. Readers have told me that they use artificial sweetener and it works just fine. Dieters leave out the oil and tell me it still turns out good. I prefer it with the added vegetable oil, but you may feel differently. I think these taste an awful lot like Wendy’s Frosties. This recipe has been one of my most popular and widely shared. I’ve seen it in several published cook books and on many other websites since I invented it. Here, for your pleasure, is the original. Makes 3 – 16oz servings or 4 – 12oz servings. NOTE: Liquid milk won’t work in this recipe. Only powdered milk will work. I love this recipe because it makes very rich milk shakes without any ice cream. I don’t always have ice cream in the house but with this recipe we can have delicious frosty milk shakes for a fraction of the cost of those using ice cream. And all the ingredients are on the pantry shelf. Add 1 tablespoon of instant coffee for a mocha shake. Add 1 very ripe banana for a chocolate banana shake. Omit the cocoa powder, reduce the sugar to 1/3-cup and add 1-tablespoon (yes a full tablespoon) of vanilla flavoring. Vanilla shakes are easy to doctor up with fruit flavorings. You can replace the cold water with liquid from canned fruit, plus enough extra water to make 1-cup. Add a few pieces of canned or fresh fruit to the mixture and blend as directed. Canned peaches are delicious for a Peach Shake. Fresh, frozen or canned strawberries are my favorite.